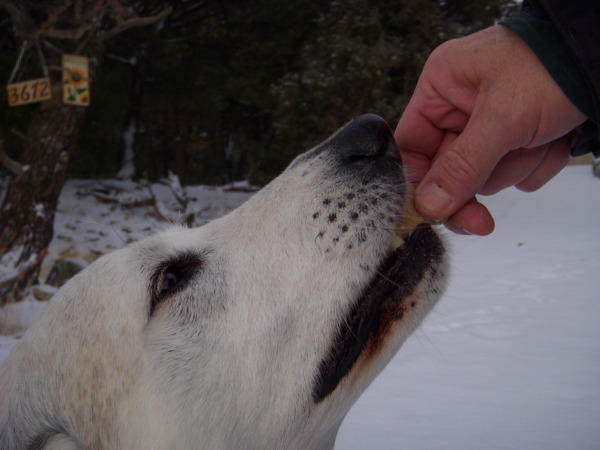 Your best furry friend enjoys treats. Store-bought dog biscuits often contain scary unmentionable by-products, and natural and organic treats can be budget-busters. What’s a dog guardian to do? Roll up your sleeves, heat the oven, and start mixing. Roll the dough out on a floured surface to a uniform thickness. Use cookie cutters to cut dough into shapes. (We used cutters shaped like dog bones, but feel free to use whatever you have on hand.) Place shaped dough on a greased cookie sheet, and bake at 350 degrees for about 20 minutes. 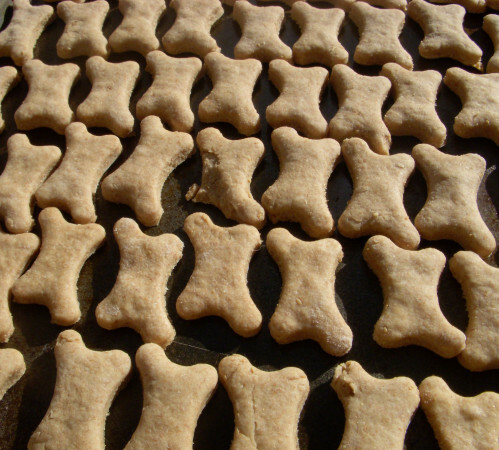 Vegan peanut butter dog biscuits, ready for the oven! Find a good excuse to give your pup a tasty treat, warm from the oven. Store leftover biscuits in an airtight container. Rex loves homemade peanut butter biscuits!